U.S. soldiers ordered two Iraqi men into the Tigris River merely to teach them "a lesson" for violating curfew and didn't think they were in any danger, witnesses testified at a court-martial. Only one of the two Iraqi civilians got out alive, authorities said Tuesday as the military trial got under way for Army Sgt. 1st Class Tracy Perkins. He is charged with involuntary manslaughter, conspiracy, aggravated assault, obstruction of justice and lying to investigators. But several platoon members insist that they never meant to cause harm and dispute that a young Iraqi drowned in the river. "We thought he was going to be all right, so we left," Spc. Reggie Martinez told a jury of six Army officers as testimony resumed Wednesday. Perkins, 33, and Army 1st Lt. Jack Saville, 24, are accused of ordering the two Iraqis into the river near Samarra in January 2004. The family of Zaidoun Fadel Hassoun, 19, said they found his body 12 days later in the river. Defense attorneys contend he safely reached shore. Perkins and Saville also each face an assault charge pertaining to the second Iraqi, Marwan Fadel Hassoun, a cousin of the other man. Saville's trial is set for March. 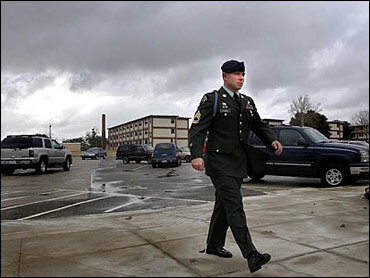 Both soldiers face up to 29 years in prison if convicted. Prosecutor Capt. Tom Schiffer told the jury the Iraqis were traveling with plumbing supplies from Baghdad to Samarra when their truck broke down close to an 11 p.m. curfew. The young men were detained by U.S. troops, Schiffer said, quoting Perkins as saying "any curfew violators are getting wet tonight." He said the Iraqis were driven to the river's edge and pushed in. Sgt. Irene Cintron, an Army investigator, testified Tuesday that government officials never had Zaidoun's body exhumed for testing because of security concerns. She said she could not confirm whether the corpse shown in a video provided by the family was Zaidoun's. Several soldiers testified that the two young men were forced into the river at gunpoint after orders by Saville, the platoon's leader. "We were showing them a lesson not to pass curfew," former Sgt. Alexis Rincon testified Tuesday. But Rincon said he saw Zaidoun's head and shoulders above the water and that he did not appear distressed. Rincon testified that he walked back to his vehicle because he thought Zaidoun was about to get out and join his cousin on the shore. Perkins and Saville are part of the 3rd Brigade Combat Team out of Fort Carson, Colo., which is part of the 4th Infantry Division based at Fort Hood.